Mission Impossible Fallout Contest is open only for those who are the legal residents of the Canada and for those who have reached the age of majority in their States at the time of Contest period. 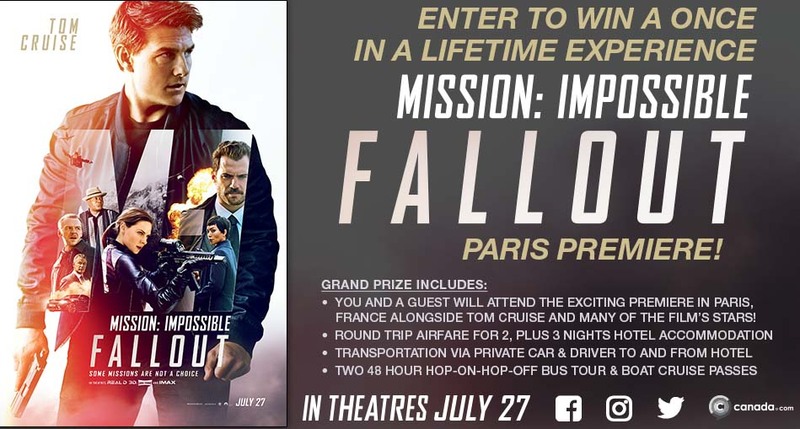 The Mission Impossible Fallout Contest began on 7th June, 2018 at 10: AM Eastern Time and ends on 28th June, 2018 at 10:00 AM Eastern Time (the Contest Period). The winner of the Contest will be selected randomly on 28th June, 2018 and the Prize for the winner is a trip to Paris, France. Eligibility: Open for the legal residents of the Canada and for those who have reached the age of majority in their States at the time of Contest period. Prize (s): A trip to Paris, France.